After writing this post I started hunting for some links to buy the book… It turns out that this book is a little harder to find than I thought! I scored my copy from the dollar section in Target (that’s right, ONE DOLLAR! ), so check there first. Amazon has copies as well. I originally didn’t think this book was anything special – I bought it to add to the book bin in my car for the kiddos I babysit (5- and 8-years-old). However, a year later and the kids STILL won’t let me take it out of the bin! They have every word memorized and they read it daily. I got in trouble today because it wasn’t in my car since I had borrowed it to write this post! A book with that much appeal certainly deserves to be featured on my blog! 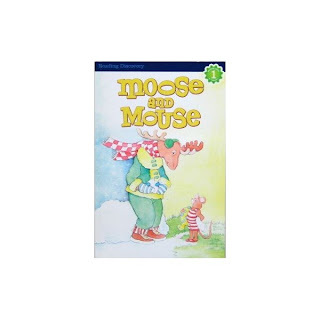 Moose and Mouse is a classic book of opposites, with loveable pictures, rhymes, and a simple storyline. It is a very short read – Just 1-2 minutes for read aloud. The book describes the life and preferences of the characters Moose and Mouse – e.g., in the morning they have to decide light toast or dark? Should the cereal be cold or hot? In addition to introducing some antonyms, the book encourages conversation about daily activities (e.g., “I like light toast.” “I never eat cereal!”). This would be a good book to read aloud to introduce the concepts of antonyms and rhyming– there are 12 pairs of antonyms and 11 pairs of rhyming words. To use this book to elicit antonyms or rhymes, cover one of the words in each set with a post-it note (post-it flags are the perfect size) and have students “fill-in-the-blank” while you read the story. They love lifting up the post-it flaps to see if they were correct. Have students go on an antonym hunt (or rhyme hunt) while reading through the book. The write down pairs as they go. For kiddos that can’t read, have them raise their hand to stop you whenever they hear a pair, then fill out the worksheet together. See here for my template for antonyms and rhymes. Continue the story! Instruct the kids to create another page about Moose and Mouse using opposites. See here for my template. I also picked this book up from Target!! I can't wait to use it in therapy this school year! Thanks for the blog post! Lots of ideas!